There have been lots of questions about where different items in the closet came from after last week’s post, so hopefully this will answer them all. I thought this was also a good post to talk about the MANY ways we saved money along the way to make this transformation possible. 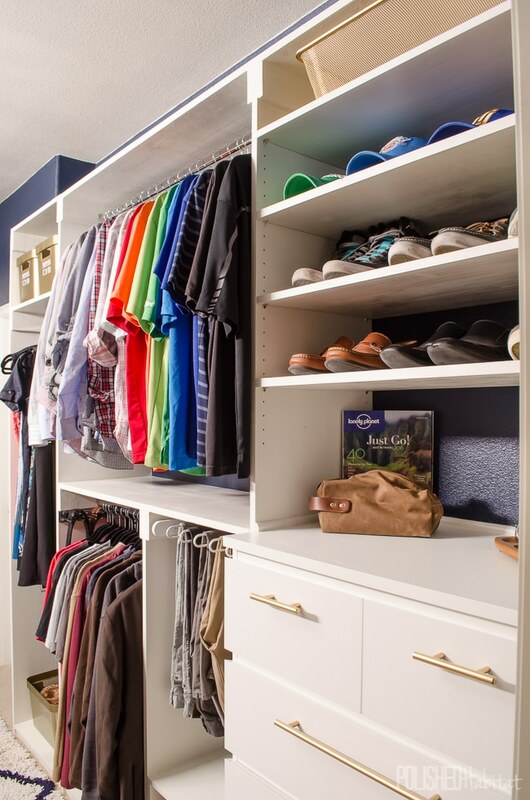 I seriously can’t fathom what this closet would have cost if we hired out the work or used a professional closet company, but my best guess would be that we’d be looking at 5 figures. Starting at the top, we saved over $1000 just on lighting. I had this grand plan to add a gorgeous fixture and then lots of recessed lights to get the brightness we wanted. Well, that lasted as long as one quote from an electrician. My dream plan would be $1000-$1500, not including the new fixture. That was half the total budget! After some sulking and paranoia, I wondered if I could find a super bright track or rail lighting system that actually looked decent. After lots of research, I found something that would work! It is SO much brighter than the old fixture. Lighting: EGLO Lighting Rail System – I purchased from 1800Lighting.com for the first time and will definitely use them in the future. Rug: Anji Mountain Silky Shag Rug with Navy Diamond , also available on Wayfair (currently ON SALE!) I picked it up from Wayfair also on sale, saving $50 over the Amazon price. 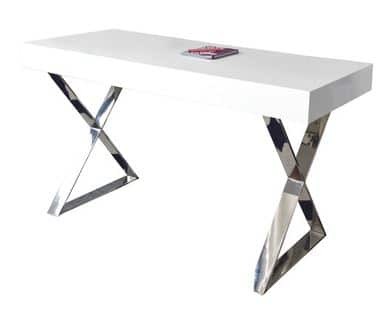 In the vanity area, my inspiration was this Jonathan Adler beauty, which was over my budget. Chair: Casper Arm Chair in Clear by LexMod Such a steal considering my inspiration version is over $2000! Huge Mirror: IKEA STAVE This price is so good that it was worth a 4 hour trip to Dallas to pick it up. Necklace Bust: Target I stalked this bust for MONTHS in the store waiting for it to go on sale and it NEVER happened. Ugh! If you are going for a higher-end glam look, these hangers are a huge bang for your buck. After a decade of wanting fancy wood hangers, I had purchased a bunch of them over time and decided they took up WAY too much room and I was hugely disappointed in them. I ended up selling the woods ones in a garage sale and used the money to buy these. I will say that the velvet hangers are VERY clingy, which I love because nothing is falling off of them. However, they make my husband a little crazy. It takes longer to get your shirts on the hanger since the fabric doesn’t really slide. Luckily he loves me more than he hates the hangers, so they are staying. Purse Storage: DIY Project – click for tutorial! I’ve always liked the products from Rev-A-Shelf, and had an experience during the last week before the final reveal that made me a life-long customer. I opened all the boxes (which had been sitting on the dining room table unopened for WEEKS) and my heart briefly stopped when I realized that the belt racks were a completely different color than the valet rods and tie rack. The boxes on all the items said chrome, but the belt racks were not at all chrome. Whaaaaa!?!?! I had less than a week before the reveal, so went for double problem solving and emailed both the third-party seller on Amazon AND tweeted Rev-A-Shelf to clarify if the belt racks came in a true chrome like the other items. The seller replied that they could check into it, but that their customer service wasn’t in the office (on a weekday!) and they’d get back to me in a few days. Fail. Meanwhile, Rev-A-Shelf came through in a BIG way. The tweet turned into an email, and their representative had me send a photo of the wrong item, and then quickly shipped out the correct item, even though I hadn’t ordered from them directly. AND she suggested I donate the incorrect items to Habitat for Humanity versus shipping them back. Talk about a win-win! From the earliest planning stages in the closet, I knew we needed lots of drawer space. With our limited skills and timeline, I was desperate to find an affordable way out of building them ourselves. I should have guessed that IKEA would be the answer, but I did research many alternatives. I selected the IKEA MALM series because of the streamlined flat sides and top. This allowed us to truly build them into to closet. I gotta say, it was a little disturbing shooting nails into a brand new dresser, but it all worked out in the end. The MALM series also comes in several sizes, which gave me maximum flexibility when designing the room. Painting the drawer pulls instead of buying them gold was a ridiculous savings again, just like it was in the pantry. The only 15″ brass pulls I could find are $36 each and I needed 8, so it would have been $288. My 10 pack in silver was $56. Just that savings more than paid for a dresser! I also used the following tools from HomeRight, my One Room Challenge sponsor. 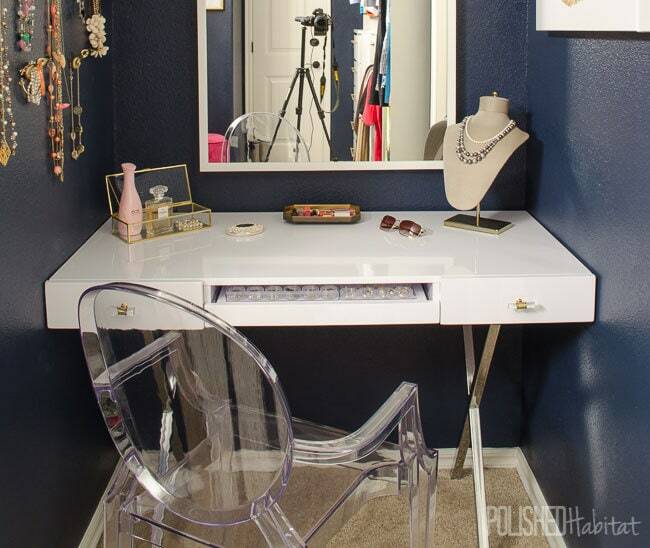 Each one made my life infinitely easier and less messy throughout the makeover. Which is good, because we seriously had ZERO extra time or capacity for mess! – Putting the first coat of white paint on the shelves with the sprayer reminded my why I love the Finish Max so much. – You may have only seen this in the week #4 post with the Finish Max, but I use it constantly, including every time I spray paint. – I couldn’t have made the clutch holders without this! Speaking of tools, here’s the low-down on what we needed to build all the shelving. This DIY aspect is were we saved an unimaginable amount. There was lots of trial and error since we aren’t woodworkers, but this proves it is possible for anyone to do it! Wood Shelving: This is an odd thing to include, but it’s not easy to find affordable wide pieces of wood big enough for a closet. At least locally, we found the best option at Lowes. They carry paint grade 16″ wide x 8 ft long pieces for $19.99. It is hard to find more than 4-5 good pieces per store, so I HIGHLY recommend having them order it ahead of when you need it. We ended up buying wood from 5 different Lowes locations in order to come up with enough, and I know some people don’t have that many stores around. Sander: Ryobi Sheet Sander I wouldn’t have blamed this thing if it had quit, it was used constantly. Cheaper wood means lots of sanding. I used to have a mouse-style sander and the replacement sandpaper was outrageously priced. With this option, you can use regular sandpaper and get 4 pieces for the sander out of every full sheet. Honestly, we probably should have invested in a belt sander for this big project, but we already had this and it held up great. Saw to Cut Metal Closet Rods: Rockwell Bladerunner I actually won this in a giveaway. It turned out to be super handy for cutting metal. Miter Saw for Wood Cutting: Ryobi 10″ Sliding Miter Saw We bought this during the closet makeover and HIGHLY recommend it for beginner DIYers. I’d even call it a must-have. 3D Design Software – Home Designer by Chief Architect – WARNING: This is not an easy software to just start using. There is a big learning curve, and much of what you see in my renderings was imported into the program from the SketchUp 3D Warehouse. You won’t be able to install the software and then drag and drop to make rooms look like the spaces I showed. Plan to spend lots of time learning and reading forums. It’s not impossible to learn, but it more complicated than you may expect from a $99 software. It’s hugely powerful for the price, but there are still limitations. I plan to upgrade to the $495 version this year, but wanted to make sure I could learn on the less expensive version. Whew – I think that’s everything, but let me know if I forgot anything. If you haven’t seen ALL the closet pictures, you can find them here. 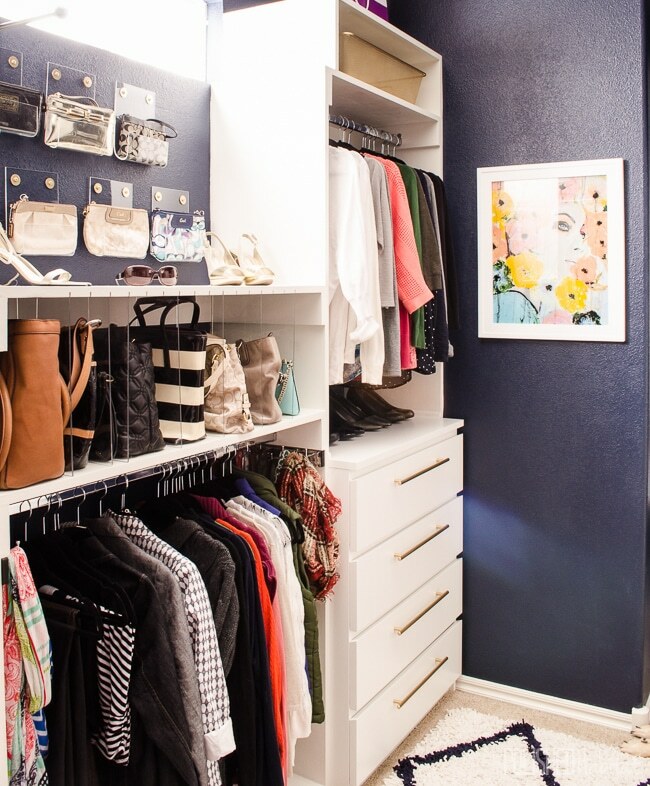 Your closet turned out so beautifully, and thank you for sharing all the sources here! I had to laugh at the comment about your husband hating the velvet hangers–we have those as well in our closet and my husband hated them so much that I ended up having to give in and let him keep the plastic ones! I talked about it a bit in this post. 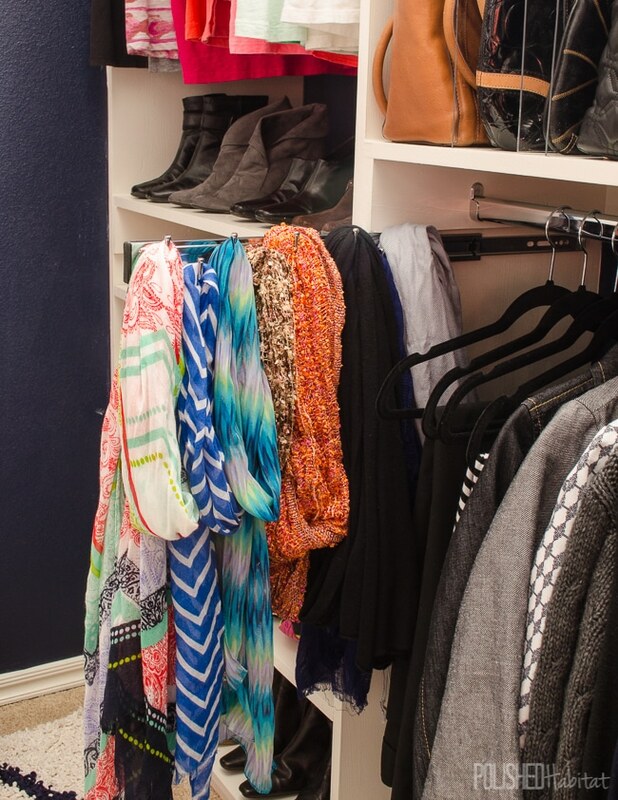 If my closet was nearly as gorgeous as yours, maybe I would have fought a little harder! Lol, maybe someday! That is so funny! The rumbling seems to have died down, so I’m hoping he is adjusting. I can’t wait to check out your link! This is awesome Melissa! I am pinning this for future reference! I bought some of those velvet hangers to try out. 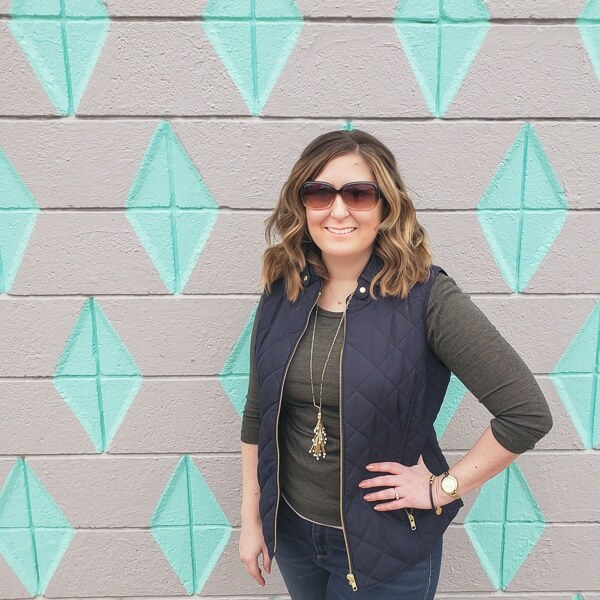 I love them for me sweaters and shirts that tend to slip off everything else, but I’m not sure I could get my hubby on board – too much time getting things off and on the hangers – Ha! I’ve got time to ease him into it I guess 😉 You’ll seriously did an amazing job on this closet!! Thanks Amanda! No clutch tutorial yet, but the weather is supposed to be a little warmer this week so we should be able to get the photos done for the tutorial. Tentatively, I have it scheduled to be posted on 12/16. That hardware on the vanity LOOKS pretty, but I really don’t recommend it at all. They are from Hobby Lobby, which usually has sturdy hardware, but one of those pulls broke during install and I had to super glue it together for photos. The other side is getting ready to break as well. After I had trouble, I noticed that they had bad reviews online for breaking just like mine. It’s a total shame because they are GORGEOUS! 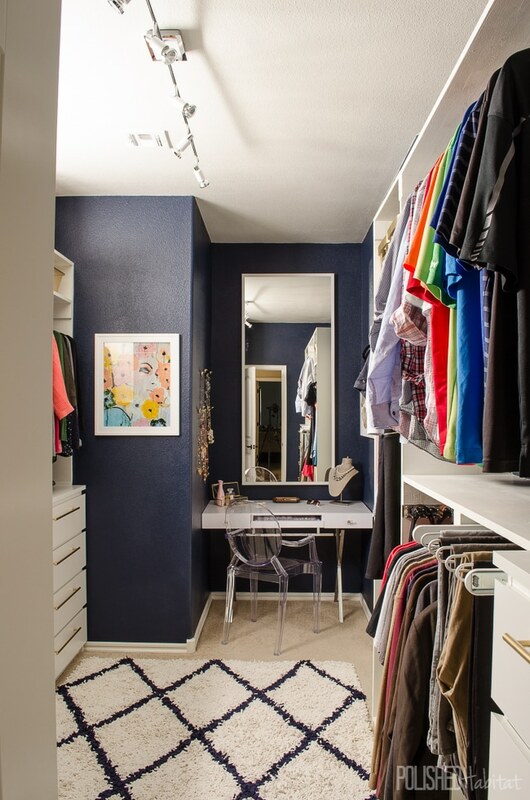 Love this closet makeover. I looked through your supply list but didn’t see anything on the actual building supplies. Did you use wood, MDF or prefabricated shelving? And is there anywhere that show the dimensions of the shelves and width of the hanging parts? Thanks! Hi Lori – we used wood. 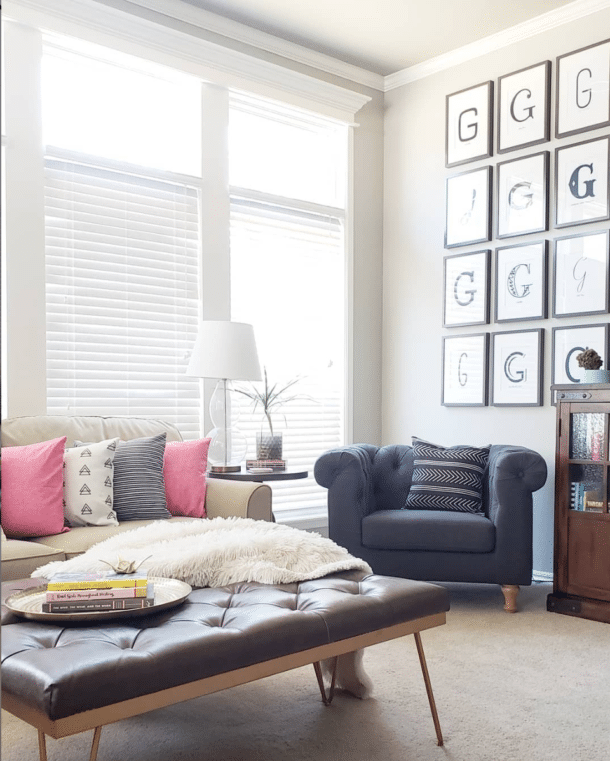 Lowe’s sells 16″ wide x 8 ft pieces, so we used 16″ as the depth for everything, which worked out really well. For the width of the sections, on my side, we started with the width of the MALM dresser and mirrored that same width to the shoe section and then the middle was whatever was left. 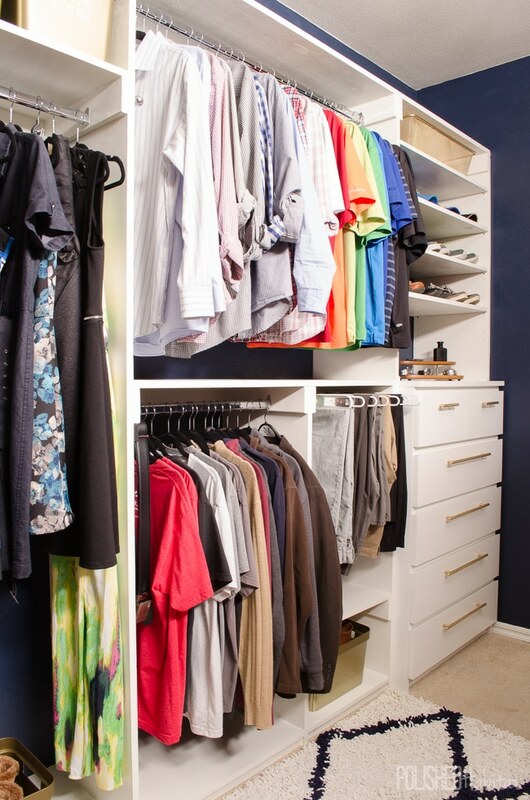 I don’t have the specific widths listed anywhere since we custom did it to our weird shaped closet, but if you are wondering about a specific section, let me know and I can do a quick measurement for you. We had my 3D renders for the rough plan and then really started at one end figured out the specifics as we built. okay thanks! one last question, the shelves above your husband’s dresser look like adjustable ones..with the holes? Yes! We made those out of the same wood, but there is a tool you can buy to space the holes out perfectly. Toward the very end of this post, there is a tools section and a link to the shelf jig thing we used. We did the same thing over on my shoe side so they could adjust to different height shoes in different seasons. We felt so fancy making our own adjustable shelves, but it was pretty easy with the jig. Love it! Your before’s look my “currently” lol. Can you tell me the length and width of your closet? I would like to compare with mine to get a sense of how much I have to cut back on the overall look. Yes, I am totally copying this! Thanks Rita! It’s a very odd shaped room, but the side with the clutches is 9 ft long, and my husband’s side is 8.5″ long. 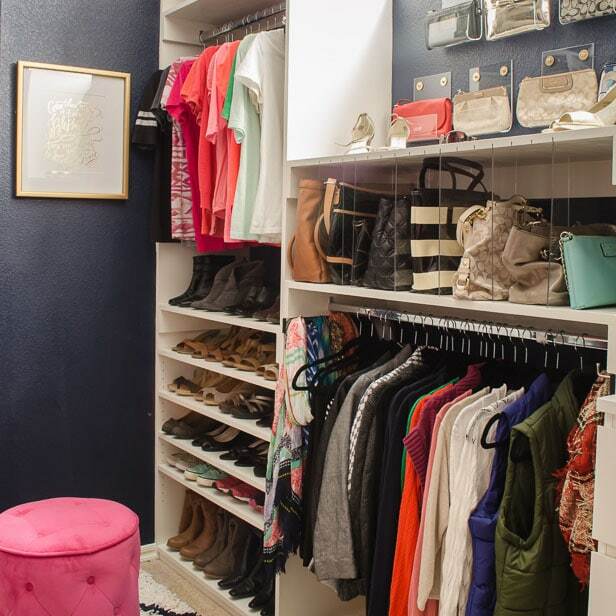 That doesn’t include the vanity nook, just the clothing/shoe/purse spaces. All the parts we built are 16″ deep, and the Malm dressers are slightly deeper than that. In between, we have just over 5 ft of floor space, which is nice, but not necessary, it just ended up like that based on the layout of the rest of the house. Hope that helps!